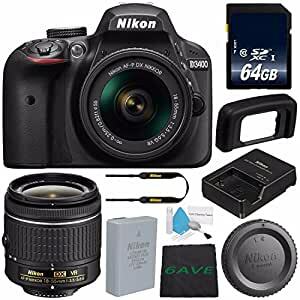 A sleek and now connected DSLR for all, the Black Nikon D3400 is designed to produce better image quality than your smartphone, yet work seamlessly with your mobile devices for sharing your memories. Utilizing a DX-format 24.2MP CMOS sensor and EXPEED 4 image processor, this camera provides a native sensitivity range from ISO 100-25600 to suit working in a variety of lighting conditions, and the sensor and processor combination also provides a 5 fps continuous shooting rate as well as Full HD 1080p video recording at 60 fps. The sensor’s design also omits an optical low-pass filter in order to achieve greater sharpness and resolution from both photos and videos. Beyond image creation, the D3400 also features SnapBridge, which utilizes Bluetooth connectivity, for wireless sharing of images to your mobile device, including automatic sharing of 2MP images between the camera and your mobile device. The lightweight camera body incorporates a 3.0″ 921k-dot LCD screen for live view monitoring and image review and, catering to first-time DSLR owners, the D3400 also features a helpful Guide Mode to aid in achieving specific photographic looks or techniques, such as how to produce shallow depth of field imagery in a helpful, step-by-step manner.